It seems like it's been ages since I've shown you some Thrift Store finds, but that's certainly not because I haven't gone! I have but summer was a busy one and I never got around to taking photos. We'll start with the find of the day, which actually could be the find of the year. 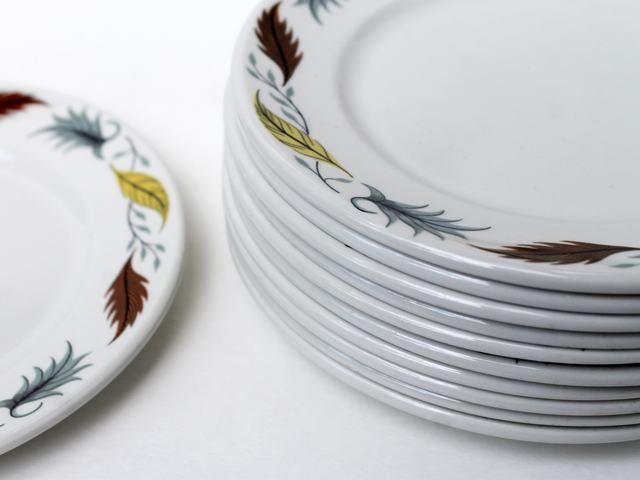 These side plates by Grindley are very rare and very collectable. I was thrilled to find a stack of 11 brand new ones for only $1 each. 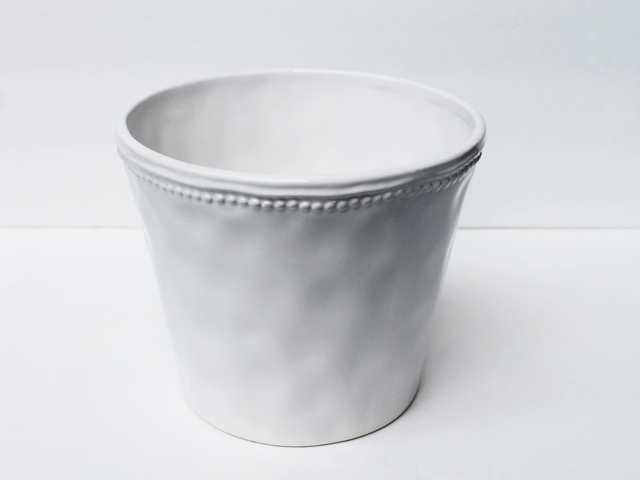 This thick durable crockery, called Vitrified Duraline Hotelware was originally designed for use in restaurants, cafeterias, and hotels, so they got a lot of use, which is why they're hard to find these days, especially in perfect condition. 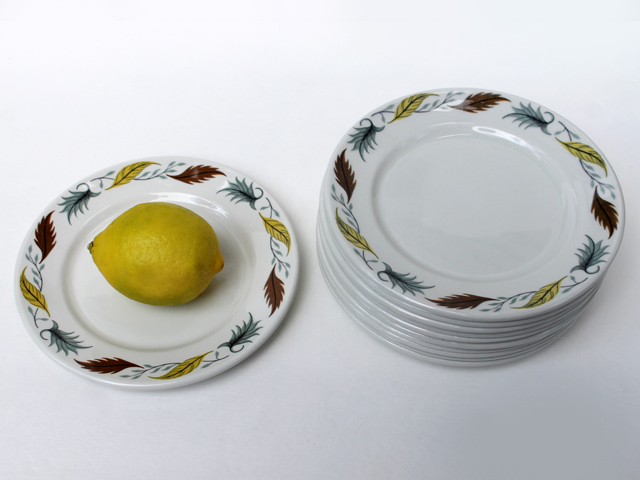 The pattern on these plates is called "Country Fair" and matches some cereal bowls and fruit bowls that I have (seen here). 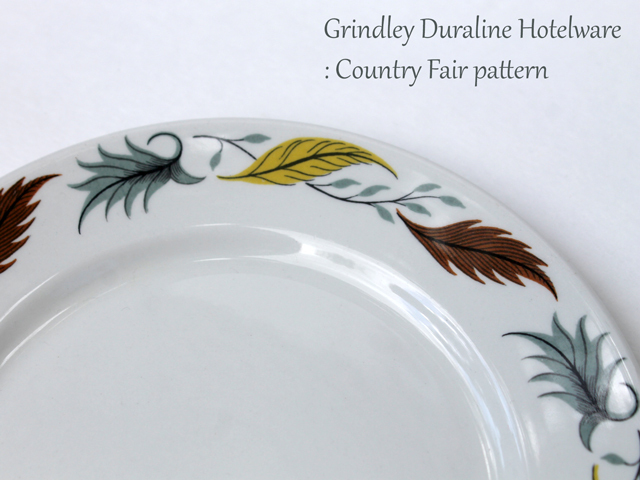 An interesting thing about Grindley Hotelware is that they stamp the date when they were made on the back of each piece -- these were made in 1972, so they've survived for 43 years. I imagine they were spares that had been put away in storage. Next up are more side plates. 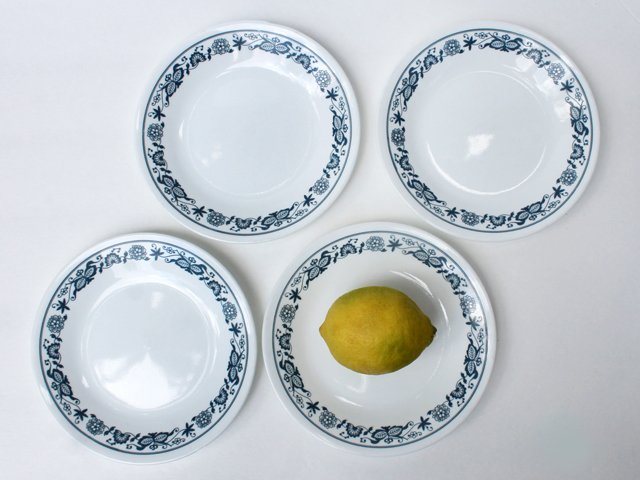 I just couldn't leave these perfect Corelle ones behind, as I collect vintage Corelle. These are the dishes we use every day, so I get good ones when I find them, especially priced at only $.75 per plate (versus the $2.99 they are at the Toronto Value Village). 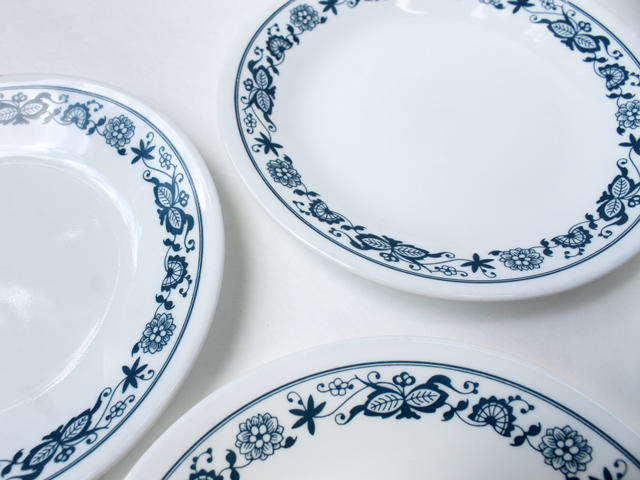 The pattern is called Old Time Blue, which stopped production in the 70s, making these plates at least 40 years old. 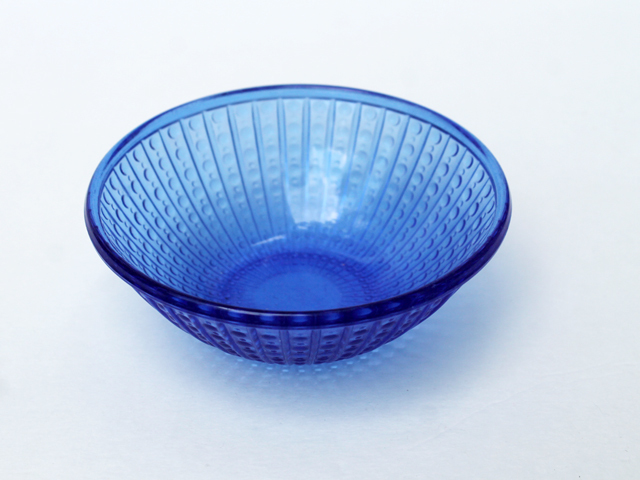 I love blue glass, so picked up this little fruit bowl for 49 cents. It has no marking or label so I don't know what it is, but it's shiny and pretty and will be handy for something. 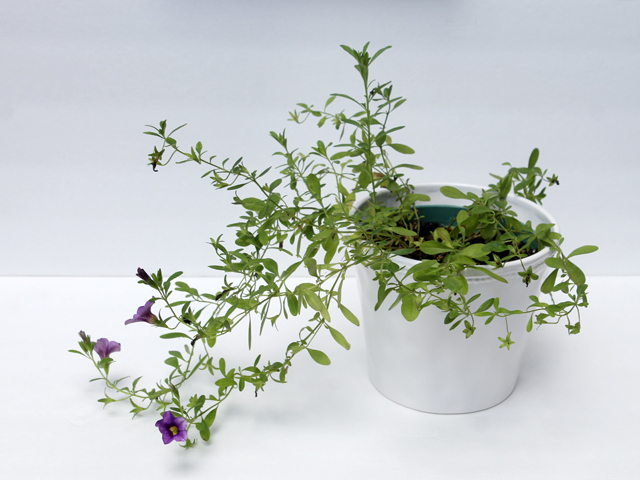 I'm always on the lookout for nice looking plant pots, so got this white one with a cute detail around the top. 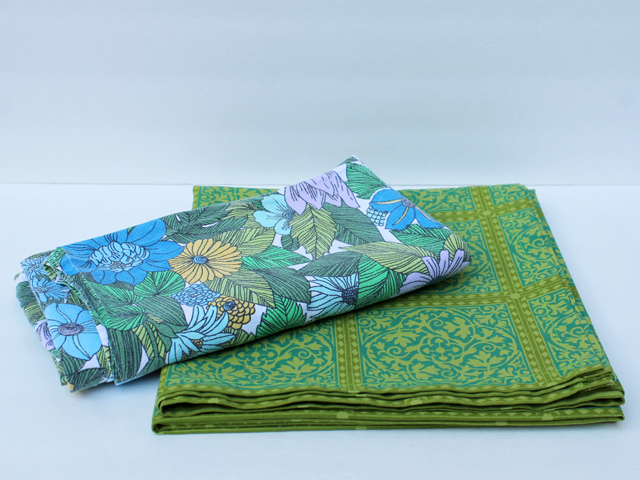 Moving over to the linens department, I was happy to find two 100% cotton vintage table cloths. 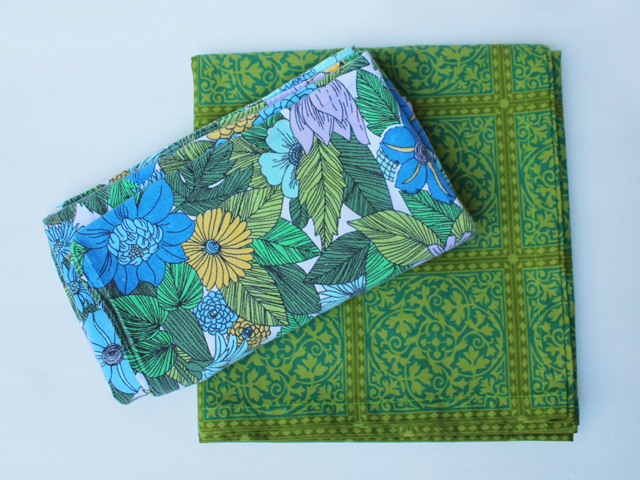 They're both square with the floral one being a small one, perfect for a little side table we use where entertaining out on the deck. Each was under $4. They've both been used already -- you can see the green one covering our table when our friends Chops and Leslie came over recently. I also found a couple of vintage tea towels that I couldn't resist at a dollar a piece. Our kitchen is open concept so our tea towels are on display, so I love to find interesting looking ones. 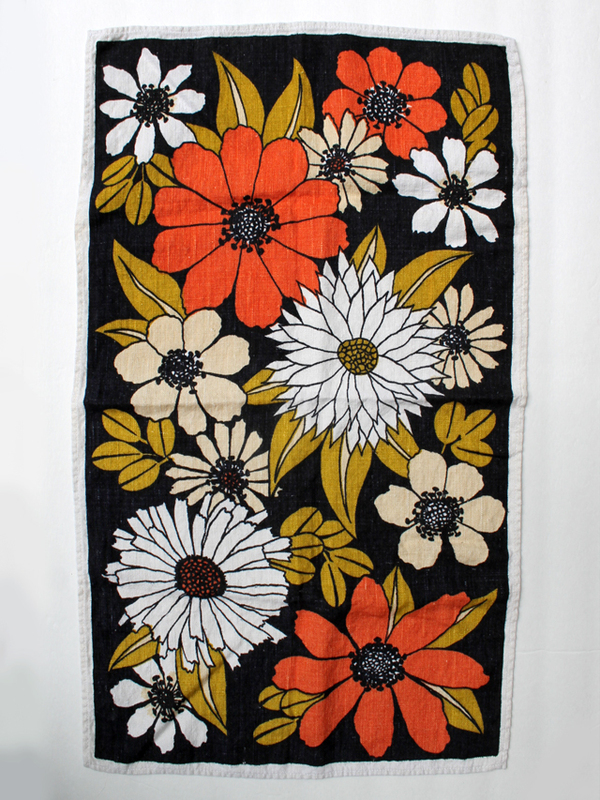 The floral one is a nice soft linen and will work well this autumn. The one with the bar scene is made of cotton and had never even been washed before. 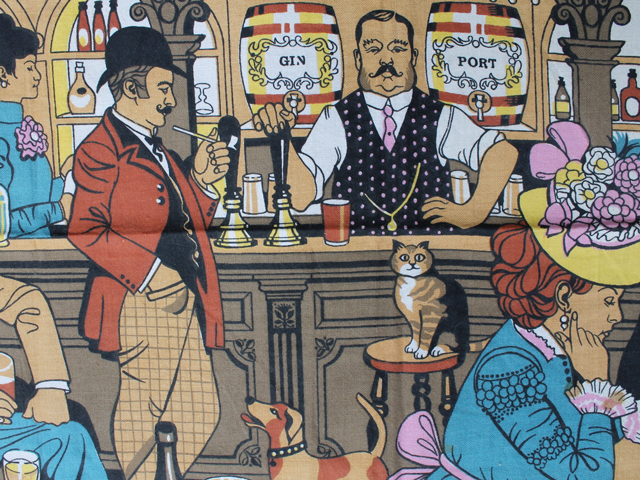 I love that there's a cat and dog in that bar! My fingers found this next item before my eyes did. 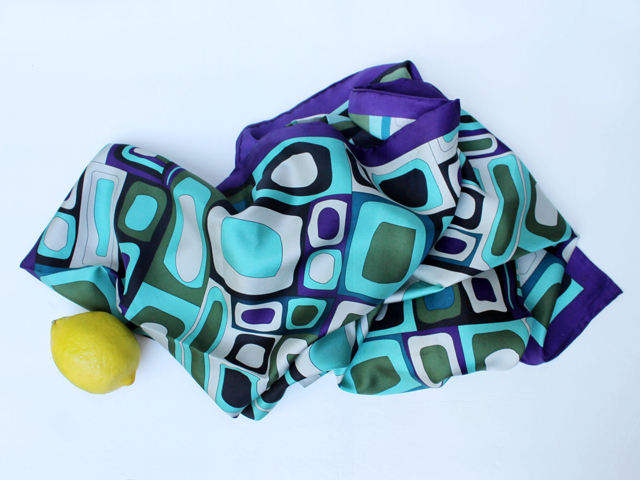 This large square scarf, with hand bound edges is made of silk that is thick and lush. 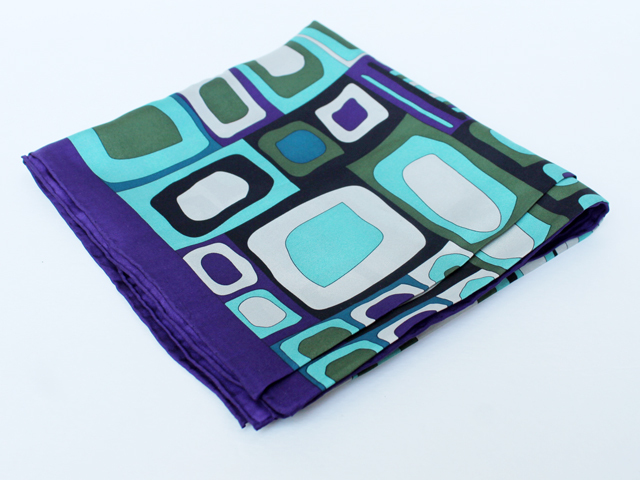 It appears never to have been used, purhaps because the greens and purple didn't appeal to the owner, or the mod look was not their style. That's ok, because it is mine. Here in Toronto it gets so cold in the winter that I often wear two scarves, a soft silk one wrapped close to my neck and then a woolly one over that. I didn't recognize the brand name Codello, but a quick search indicates that this is a luxury make from Europe. A good find for $2.99. 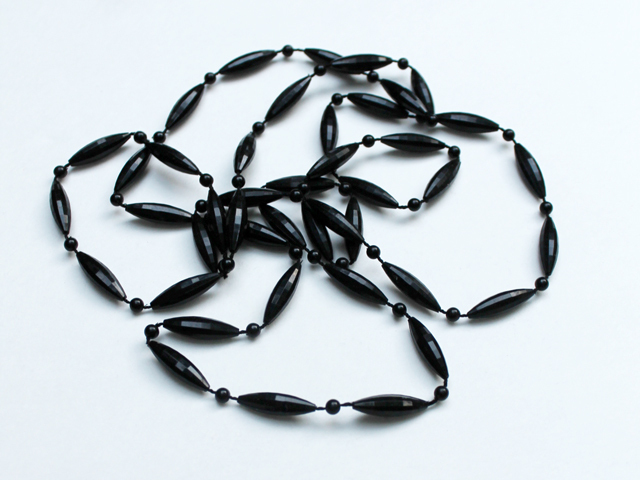 I really like these long vintage plastic necklaces and have a variety of colours, with different shaped beads. They're very lightweight and comfortable to wear -- great for throwing over a t-shirt. I wear them all the time, so picked up this nice black one with no deliberation. It was $1.99. 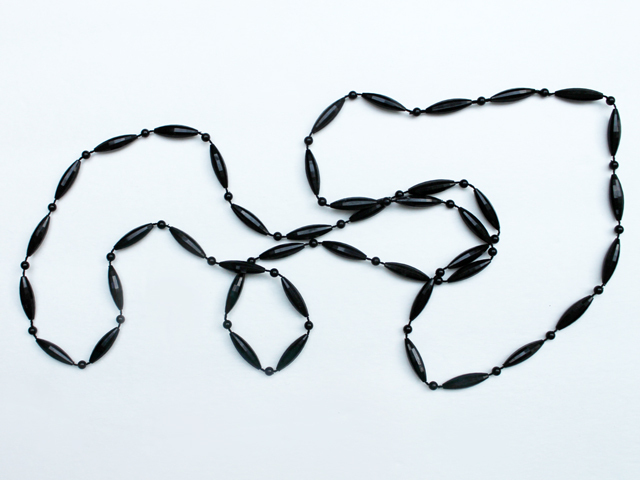 This type of necklace would have been a low-cost option back in the 50s and 60s. I actually prefer them to the "real" thing (such as this jet one I thrifted a couple of years ago) because the beads are attached to the cord so there is no worry about breaking one and having the beads go all over the place, which is something that certainly can happen with long necklaces like this, especially vintage ones with old fragile cords. 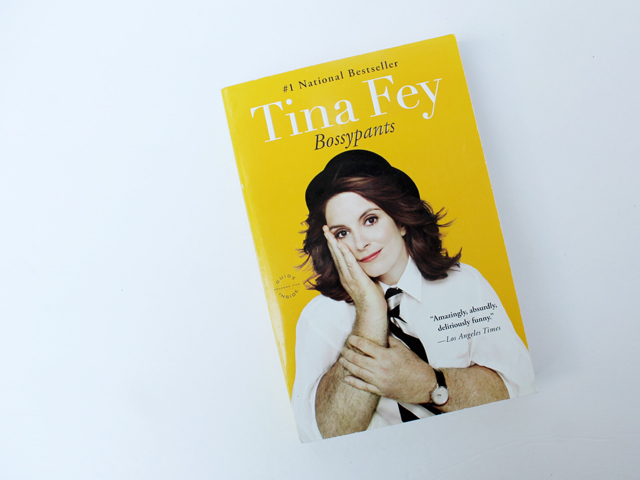 I've been wanting to read Tina Fey's book Bossy Pants, so picked it up when I saw it. I'm actually reading it right now and love it. Lastly, I got this never-been-used leather cushion. It has a zipper at the back and the stuffing is feathers. 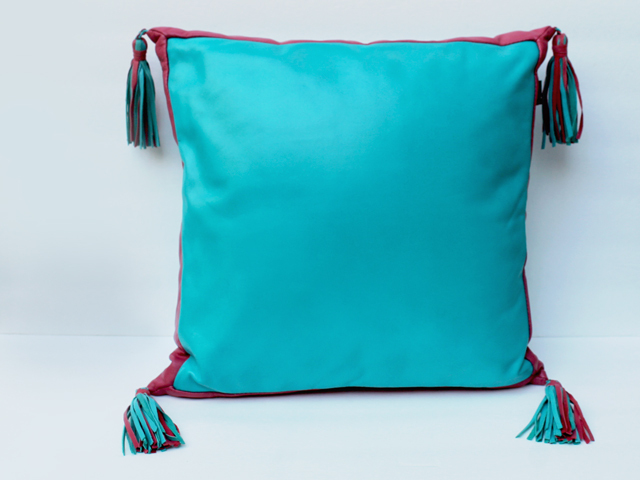 I have to say that at first I wasn't thrilled with the colour combo of turquoise and fuschia, and actually put it back on the shelf. But then we needed one more item to bring us up to the $30 that would result in 30% off everything, so basically it was free and would reduce the cost of the other stuff too, so why not? 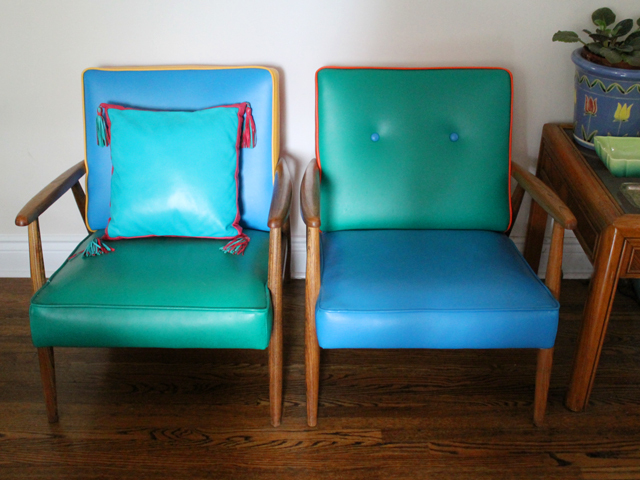 I didn't anticipate how well it would go with our favourite chairs, these vintage colour-blocked ones that are located in the kitchen. It's an understatement to say that these chairs get a lot of use -- we used them all the time, and the cushion goes really well with them and is very comfortable. About these chairs -- I bought them from a friend of a friend who had hired me to dj his studio opening party. His business was refurbishing vintage furniture. While I was at the party I spotted these chairs in his work area. The vintage hardwood frames were solid (and a brand I should know but forget). The coloured thick vinyl was also vintage, remnants from an old factory. They didn't have enough of one colour to redo a whole chair so they mixed up the colours. I absolutely loved them and bought them on the spot, using the proceeds of a win from the slot machines at the casino. I had gone to Casino Rama on a lark the week before with my mom, and not only did I win one big prize, but I won twice that day. 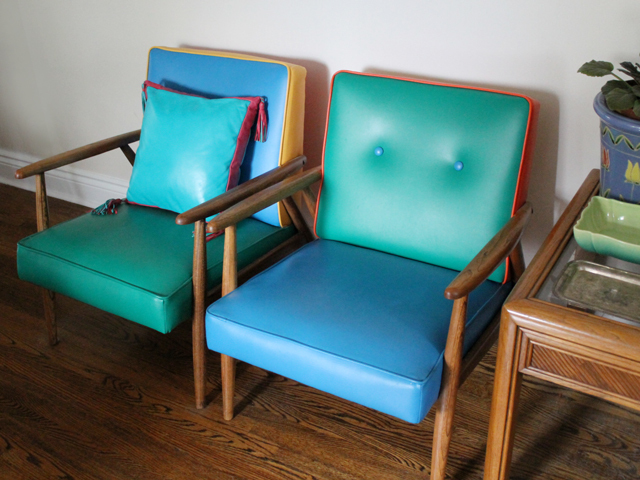 I had enough to share a bit of fun money with my family and to get these chairs. That was fourteen years ago and I haven't been back to the casino since but remembering that fun time makes me think I should go. Thank you very much for checking out my thrift store finds. 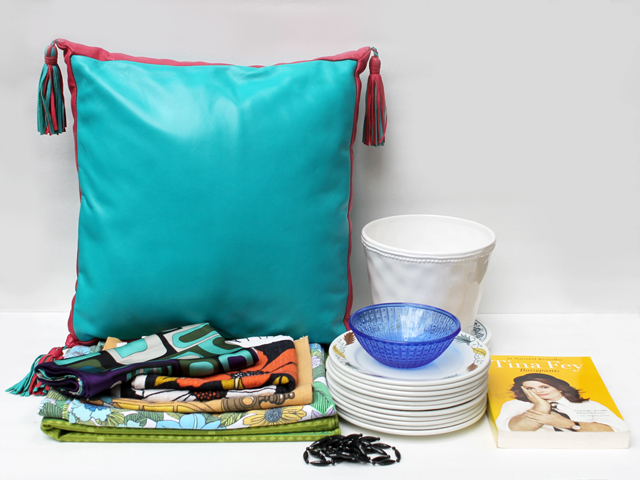 Here's to keeping second-hand items in circulation! 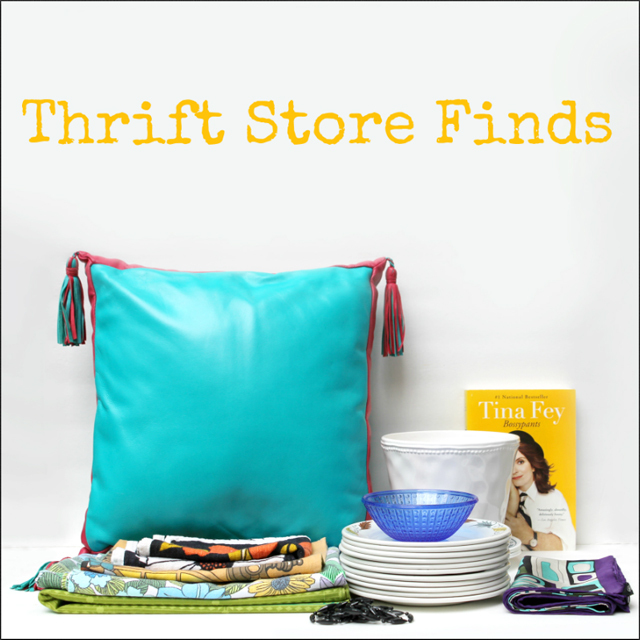 A great collection of thrifty finds! 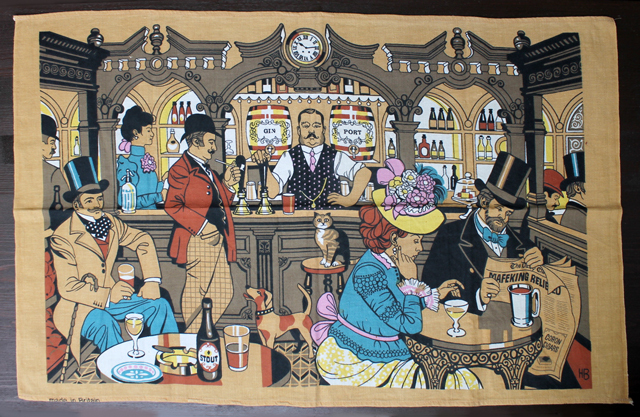 I love the tea towels, specially the bar scene. The Corelle plates are lovely. I love blue & white crockery & that is a particularly good design. pretty plates.. those linens and scarf.. what a great find! Amazing finds!! I love those vintage tea towels, and I remember reading Bossypants a few years back and found it utterly hilarious.